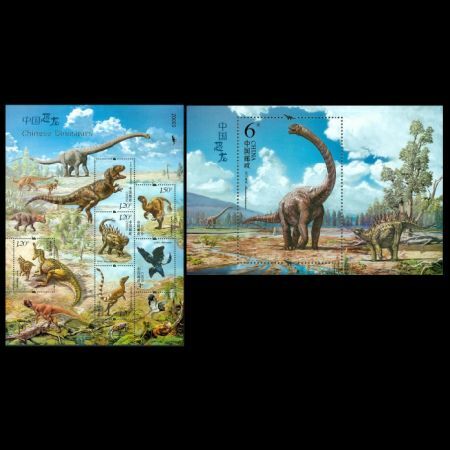 On May 19, 2017, first time since 1958, Chinese Post issued a set of seven dinosaur stamps: Mini Sheet of six and Souvenir Sheet with one stamp with title "Chinese Dinosaurs" (stamps with the same title issued in Hong Kong in 2014). 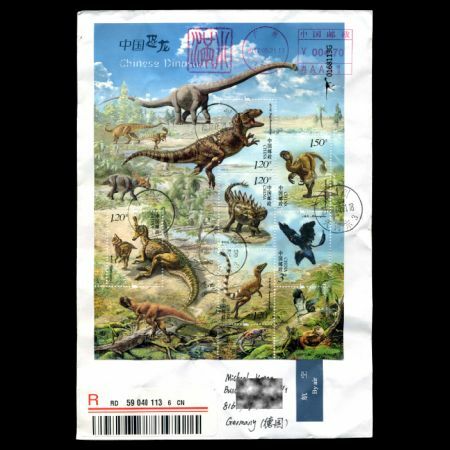 Zhao Chuang (32), a Beijing-based artist, who designed the stamps, has drawn several birdlike dinosaurs for Chinese paleontologists who have found the fossils, and his images appear at scientific articles in international magazines and journals, says: "Dinosaurs are still with us today" and explains this by saying that dinosaurs are accepted as the ancestors of birds, and that birds make up the largest proportion of vertebrates in the world. The illustrator believes that to propagate the knowledge of dinosaurs, more ways should be used, including postage stamps, which he calls "a museum on paper". For security reasons and to attract philatelists, the stamps printed with special ink and used fluorescent technology that allows to see the dinosaurs bones and normally invisible security number of every stamp under UV light. 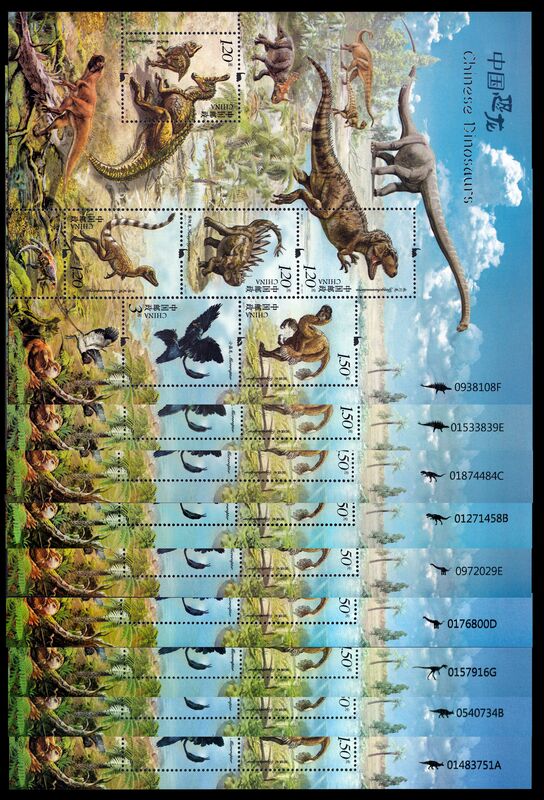 Another features of these stamps are big diversity of Mini Sheet's numbers and dinosaurs silhouette attached to it. 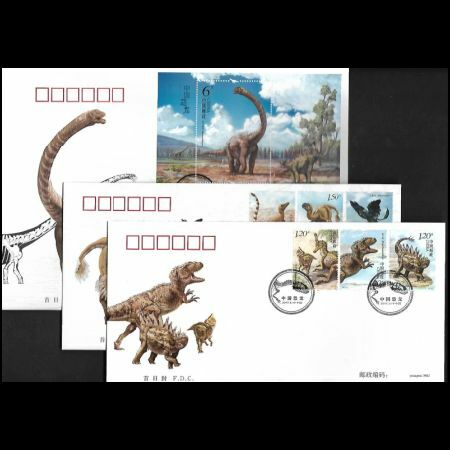 The image on the right side shows seven different combinations of dinosaur silhouette before the number and a letter behubd it (the number itself is a running number). 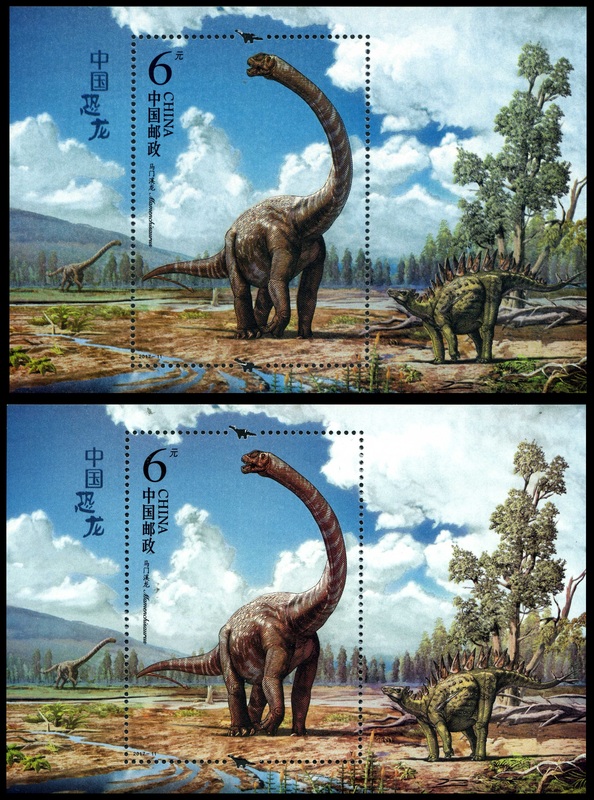 Initial draft of the Souvenir Sheet (top view) distinguished from the released stamp (bottom view) by: silhouette of dinosaur in stamp perforation on top and bottom side of a stamp, position and text color of stamp's label on top-left side of the sheet, location of young Mamenchisaurus on the left side, Pterosaurs fly on the background of the draft not exist on released stamp, the clouds form is also different. Dinosaurs were a type of reptile that came into existence during the Mid to Late Triassic (approximately 234 million years ago). 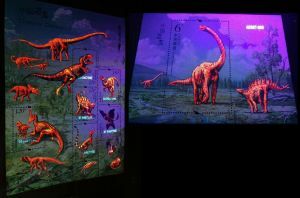 Among them, the non-avian dinosaurs perished from the world’s stage at the end of the Cretaceous Period (approximately 66 million years ago), and the species that were fortunate enough to avoid extinction subsequently evolved into modern-day species of birds. 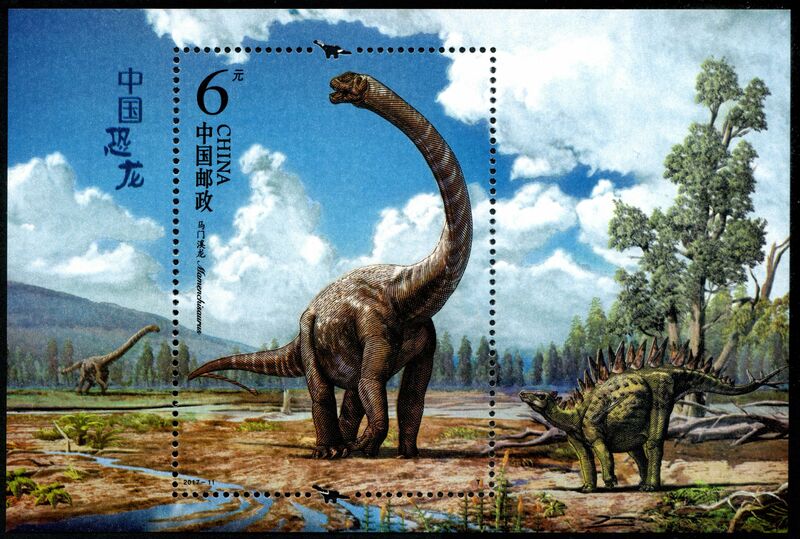 China is rich in dinosaur fossils, and is often referred to as the nation with the richest dinosaur remains. 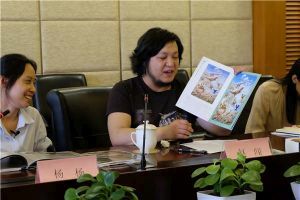 Even though formal research of dinosaurs in China began at a relatively late stage, this field of study has developed rapidly. 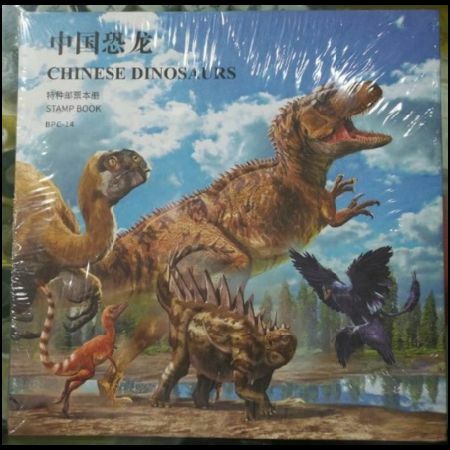 After nearly a century, Chinese research is now at the forefront of the paleontological world. 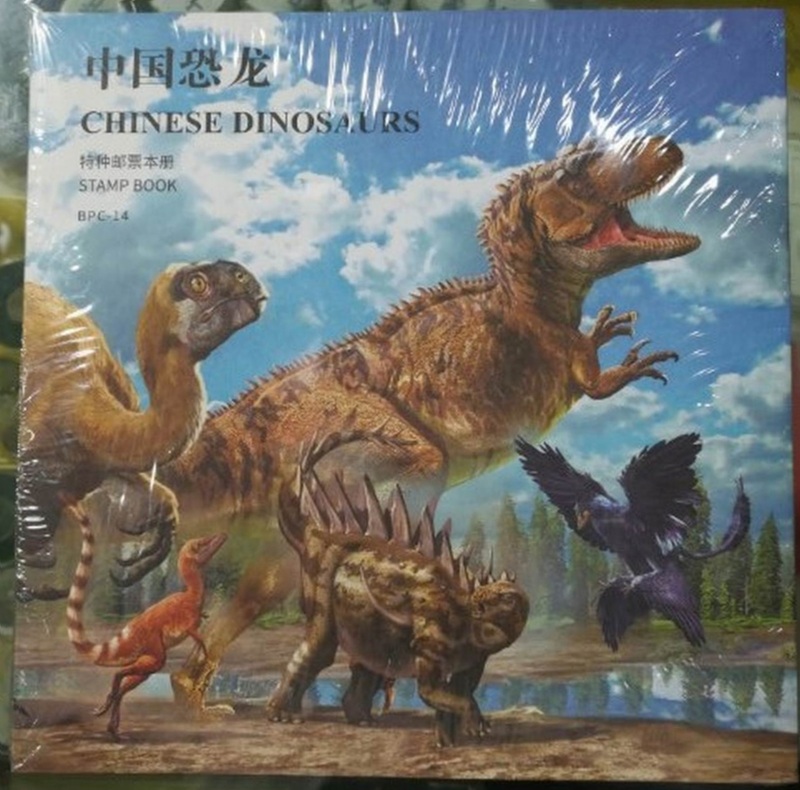 By the end of May 2014, China had officially named 244 different species of dinosaurs, ranking first overall in the world. 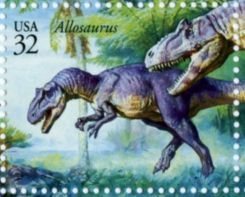 The Mamenchisaurus, featured on the souvenir sheet, existed during the Late Jurassic. 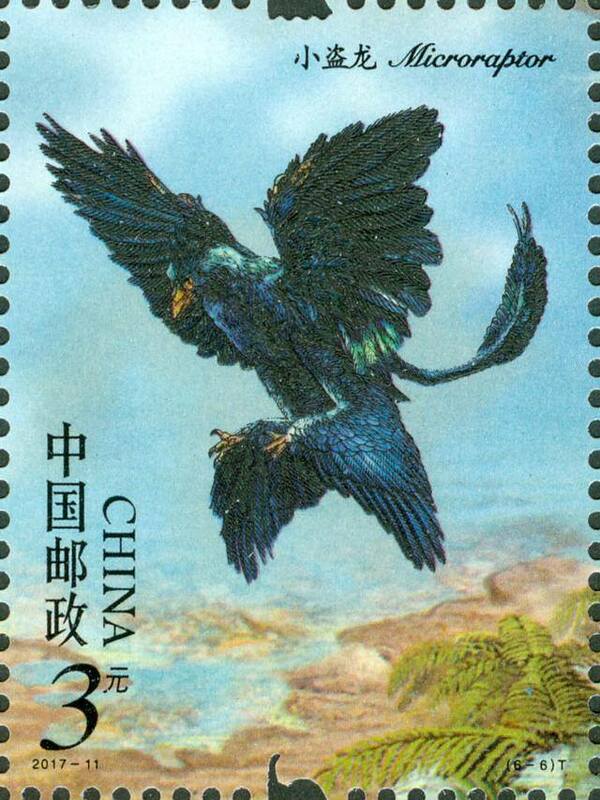 Fossils of this specimen have been discovered in Sichuan, Chongqing, Xinjiang and other regions of China. It had a huge body that was approximately 22 meters in length, of which its slender neck accounted for almost half of its total body length. The neck of the Mamenchisaurus was set at an angle from the ground, in order to raise its head higher. Moreover, it had a very broad chest and rounded abdomen, in addition to an enormous “tail hammer” that was positioned at the end of its tail. 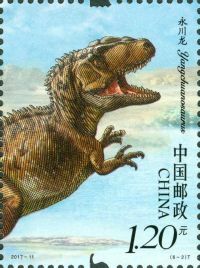 The fist time Mamenchisaurus appeared on stamp of Mongolia in 1990. The dinosaur was first discovered in 1952 on the construction site of the Yitang Highway in Sichuan, China. 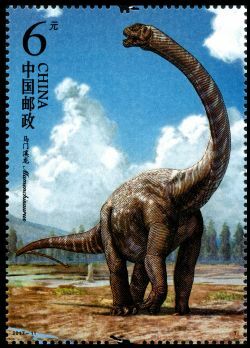 The partial skeleton fossil was then studied, and named Mamenchisaurus constructus in 1954, by the renowned Chinese paleontologist Professor C. C. Young. Note: Yang Zhongjian (1 June 1897 – 15 January 1979), courtesy name Keqiang, also known as C.C. 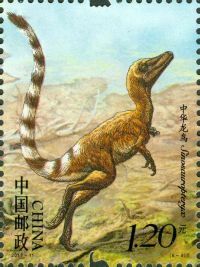 (Chung Chien) Young, was one of China's foremost vertebrate paleontologists. 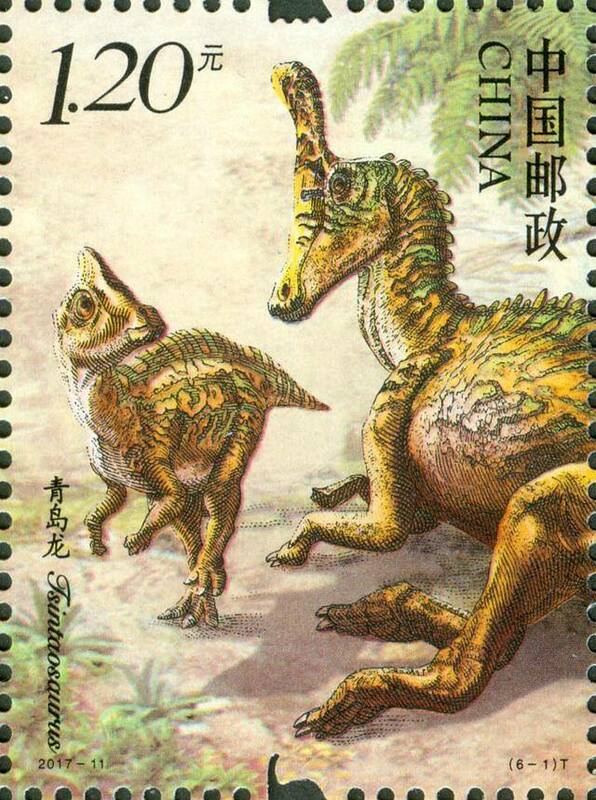 He has been called the 'Father of Chinese Vertebrate Paleontology'. Tsintaosaurus as a large-sized hadrosaurid, which lived during the Late Cretaceous. Its fossil was discovered in Laiyang, Shandong Province. The Tsintaosaurus had a very strong and powerful body, which was approximately 8 meter long, as well as a large and ﬂat snout, and a tube-like nasal bone, which was positioned vertically on its head. This creature moved with four limbs and preferred to live withothers together in a herd. In 1950, at Hsikou, near Chingkangkou, in Laiyang, Shandong, in the eastern part of China, various remains of large hadrosaurids were uncovered. In 1958 these were described by Chinese paleontologist Yang Zhongjian ("C.C. Young") described it as the type species Tsintaosaurus spinorhinus. The generic name is derived from the city of Qingdao, earlier often transliterated as "Tsintao". The specific name means "with a nose spine", from Latin spina, and Greek ῥίς, rhis, "nose", in reference to the distinctive crest on the snout. Yangchuanosaurus this dinosaur lived in China during the Bathonian and Callovian stages of the Middle Jurassic, and was similar in size and appearance to its North American relative, the Allosaurus. The earliest fossils of this specimen were discovered in Chongqing n 1976. During a thunderstorm in June 1976, Lyu Xiangzhi, deputy commander of a local reservoir, was on his way to check a dam with his colleague when they stumbled upon a white object exposed from a rock. It was very hard and looked similar to an animal bone. Later, an expert identified the fossil to be a carnivorous dinosaur head with well-preserved jaw teeth. The local government conducted a large excavation project around where the fossil head was found. About 20 days later, a complete fossilized dinosaur was found. 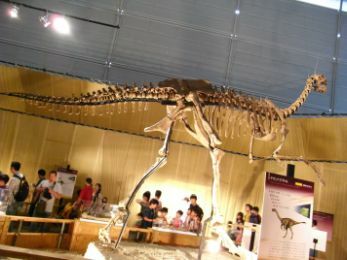 This Yangchuanosaurus fossil is now preserved at the Chongqing Natural History Museum, as a major treasure of the museum. The body of the Yangchuanosaurus was huge, with a length of approximately 8 meters. Moreover, it had a massively shaped head, and strong, razor-sharp teeth, which were serrated. They had well—developed hind limbs which allowed them to run at very fast speeds. The Huayangosaurus belongs to the Stegosauria, and lived during the Middle Jurassic. 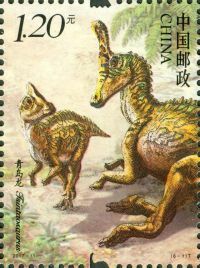 In 1979 and 1980, remains from twelve stegosaurian individual animals were recovered from the Dashanpu Quarry near Zigong in Sichuan. 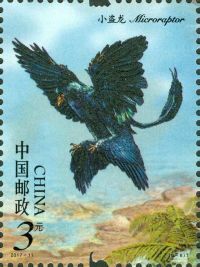 They were named and described by Dong Zhiming, Tang Zilu and Zhou Shiwu in 1982. It was approximately 4.5 meters long, it was also much smaller than its famous cousin Stegosaurus, with powerful and well-built limbs, and 32 bone plates that were lined along its back in two symmetrical rows. 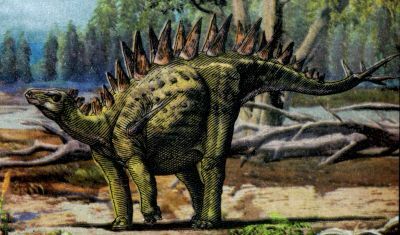 In addition, its shoulders and tail were girded with long spikes. Like other stegosaurians, Huayangosaurus was a quadrupedal herbivore with a small skull and a spiked tail. The Sinosauropteryx was a carnivorous creature. 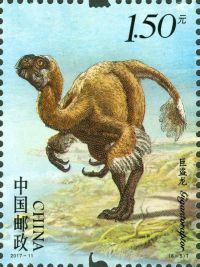 It lived in the Early Cretaceous, and its fossils were discovered in Liaoning Province. Its body was only 1~2 meters long. Described in 1996, it was the first dinosaur taxon outside of Avialae (birds and their immediate relatives) to be found with evidence of feathers. It was covered with a coat of very simple filament-like feathers. Moreover, it is also the ﬁrst dinosaur to successfully have its color determined by scientiﬁc restoration. Sinosauropteryx was a small theropod with an unusually long tail and short arms and had several features unique among all other theropods. It had 64 vertebrae in its tail. This high number made its tail the longest relative to body length of any theropod. Its hands were long compared to its arms, about 84% to 91% of the length of the rest of the arm (humerus and radius), and half the length of the foot. The first and second digits were about the same length, with a large claw on the first digit. The first fingers were large, being both longer and thicker than either of the bones of the forearm. The Gigantoraptor is the largest known Oviraptor to have existed. 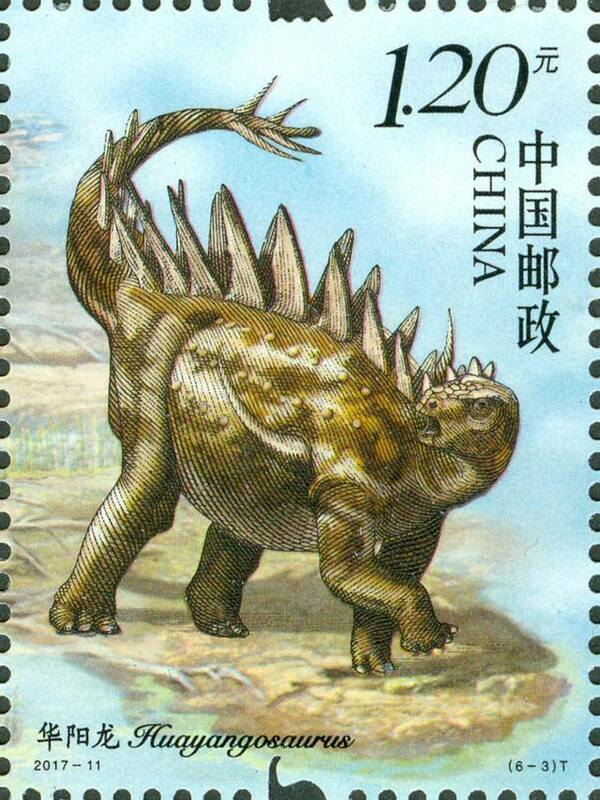 It lived in the Late Cretaceous, and its fossil was discovered in Inner Mongolia. It was 8 meters in length and weighed more than 1,400 kilograms, which is comparable to the body size of the Tyrannosaurus. Relative to its size, Gigantoraptor had unusually slender limbs and lengthy legs. The researchers theorize that Gigantoraptor may have used its feathers for display or for incubating its eggs. Past studies suggest oviraptorosaurs may have had long feathers on their arms and bodies for covering their eggs. The diet of Gigantoraptor is uncertain. Although some oviraptorosaurs, are thought to have been mostly herbivorous, Gigantoraptor had long hind legs with proportions that allowed for fast movement, and large claws, a combination that is not usually found in herbivores of this size, therefore it is suggested that Gigantoraptor was also a herbivore and used its speed to escape predators. The Microraptor is one of the smallest dinosaurs to have ever been discovered, and also is the ﬁrst dinosaur to have been found that had four wings and was able to ﬂy. 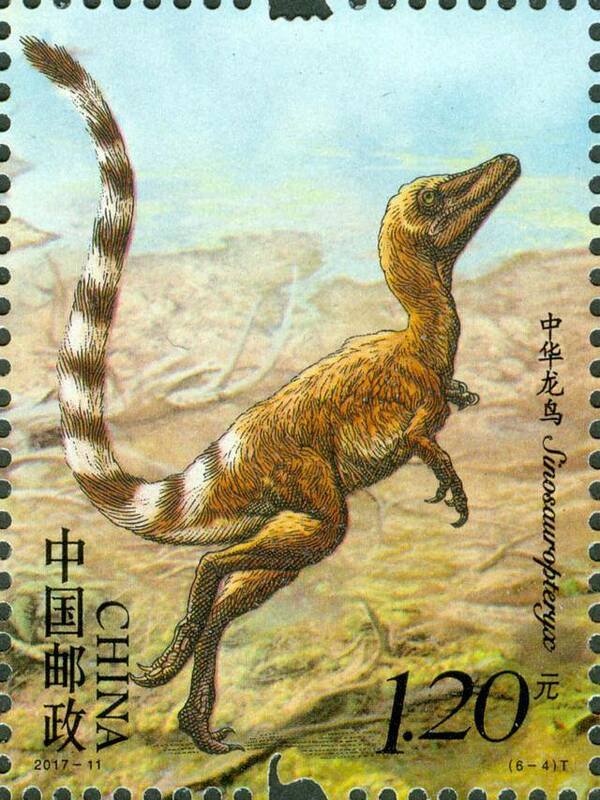 It lived in the Early Cretaceous and its fossil was discovered in Liaoning Province. Its body length was only 55~70 cm, and it had a very petite body structure. Like Archaeopteryx, well-preserved fossils of Microraptor provide important evidence about the evolutionary relationship between birds and dinosaurs. Microraptor had long pennaceous feathers that formed aerodynamic surfaces on the arms and tail but also on the legs. 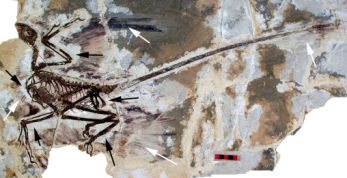 This led paleontologist Xu Xing in 2003 to describe the first specimen to preserve this feature as a "four-winged dinosaur" and to speculate that it may have glided using all four limbs for lift. Subsequent studies have suggested that Microraptor was capable of powered flight as well. Microraptor was among the most abundant non-avialan dinosaurs in its ecosystem, and the genus is represented by more fossils than any other dromaeosaurid, with possibly over 300 fossil specimens represented across various museum collections. Wikipedia: Mamenchisaurus, Tsintaosaurus, Yangchuanosaurus, Huayangosaurus, Sinosauropteryx, Gigantoraptor, Microraptor.